So, I know that I have a tendency to talk about food. A lot. I like food. It is tasty, comforting, and fuels my mooooo-scles #gettingbig. We all did quite a bit of eating this past weekend regardless of our patriotic tendencies. If you saw my post from Monday, you can easily observe that I consumed pretty much anything and everything that was not nailed down. I am going to take a minute and highlight some of my favorites apart from the main Thanksgiving Feast, as I have already beaten that one senseless. Thank you to the lovely Jenn over at Peas and Carrots for hosting this gathering, a weekly Thanksgiving that can be shared by any and all. Friday was a day of seriously expansive noms. It is tough to pick any single meal, but as I already went into slightly more detail about Chicago q, I wanted to revisit our lunch at Ma & I at the south west corner of Grant Park @ 1234 South Michigan Ave. I was introduced to Ma & I this summer by an architect friend/mentor, and it instantly became a favorite. 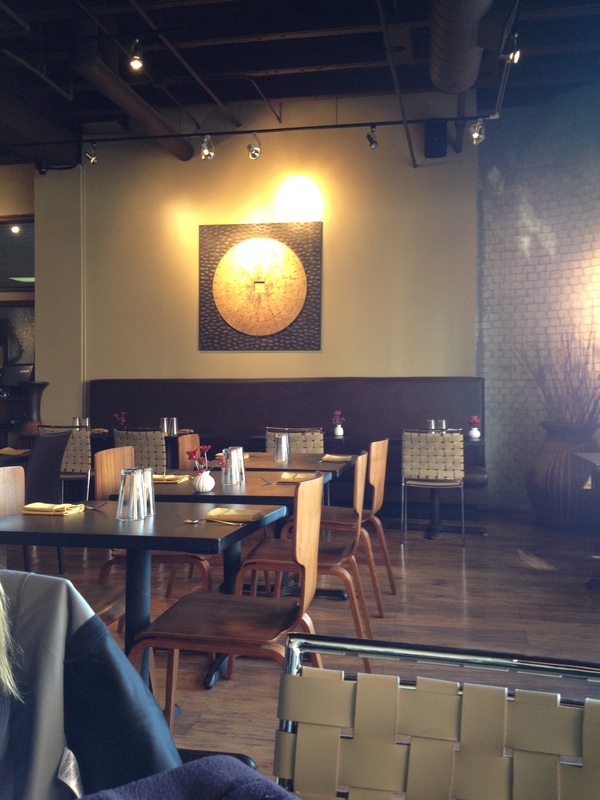 Like many Asian restaurants, it has an expansive menu that accommodates a fusion of cultures and cuisines. This makes for an awesome variety, but a very difficult choice. Basically, half of the menu is Thai, and the other half is focused on sushi and sashimi. Lighting from outside messed with the image, but you get the idea. One of my favorite aspects of the restaurant is that it feels kind of like a hidden gem, even though it is right on Michigan. You are below the crowds, and this is a place that people come to because they know and love it. It is clean, modern in design, and just really lovely inside, and they open the windows onto the street during the summer. And, you gotta love this, they play the best music. I have yet to hear the exact same genre any of the 3 times I have been, but it tends to an awesomely eclectic mix of Jessica Simpson (With You), Coldplay, and other favorites that are not in your usual rotation. One of the reasons that I LOVE Thai food is that there is typically an equal emphasis on rice/noodle dishes as on the other dishes. Furthermore, there are typically options for those of us who cannot do heavy oils or creams (which usually mean that I have to stick to simple Tandoori at Indian establishments and am basically SOL apart from the very simple steamed options at Chinese restaurants). I also don’t like white rice (I know that you can get brown rice, but I don’t like it enough anyway to pay extra for it) and I’m not a big noodle person. In fact, the only noodles that I actually like are the ones they use in the Pad Ke Mao at Thai Market in NYC. But that is another story for another day…. FOCUS. My other fave aspect of Thai cooking is the objective of flavor balance: sweet, sour, salty, umami, spicy. I love the layering of flavor, all complemented by incredible texture (thus why I’m not a big noodle person) and fresh vegetables not DROWNED in oil/butter/etc. My favorite Thai dishes are summer rolls (particularly if they are the kind without vermicelli) with a plum, bean, or sweet/sour sauce, Som Tum salad, Tom Yum soup (chicken or shrimp), and a new favorite, Naem Sod with chicken. Noodle-dish wise, I like Pad Ke Mao, and I always like a taste of a curry, especially Panaang, but not enough to order the whole thing. Also, I love, love, love Pad Thai, but will only eat it if I myself make it. I have learned that lesson the very hard (er, bloated and loose? TMI) way. So what did I get at Ma & I this trip: Feast your eyes. 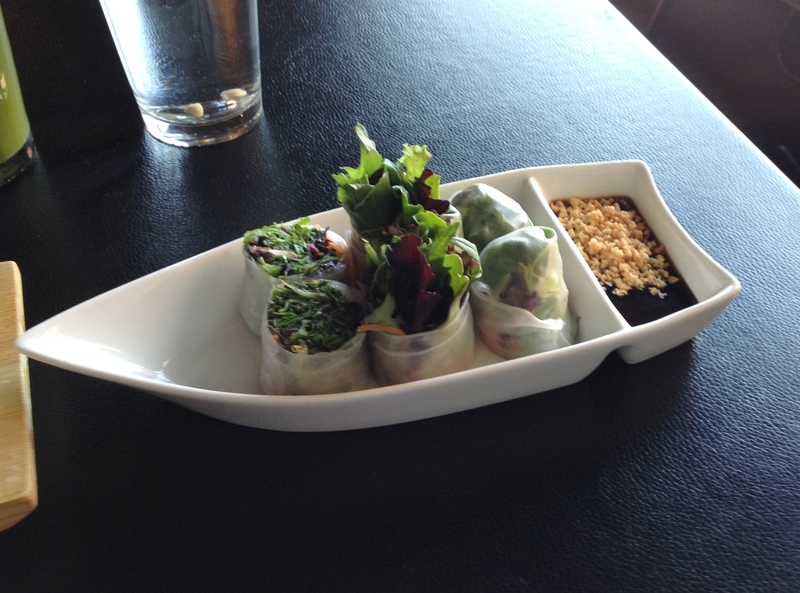 Amazingly fresh summer rolls (I totally forgot these were a salad in themselves!) 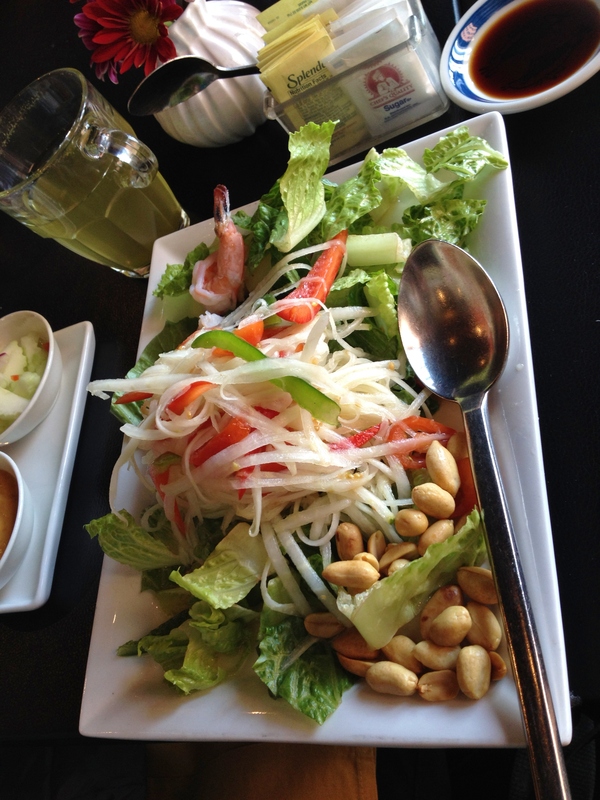 with shrimp and a plum/bean/peanut sauce. Wiped clean. 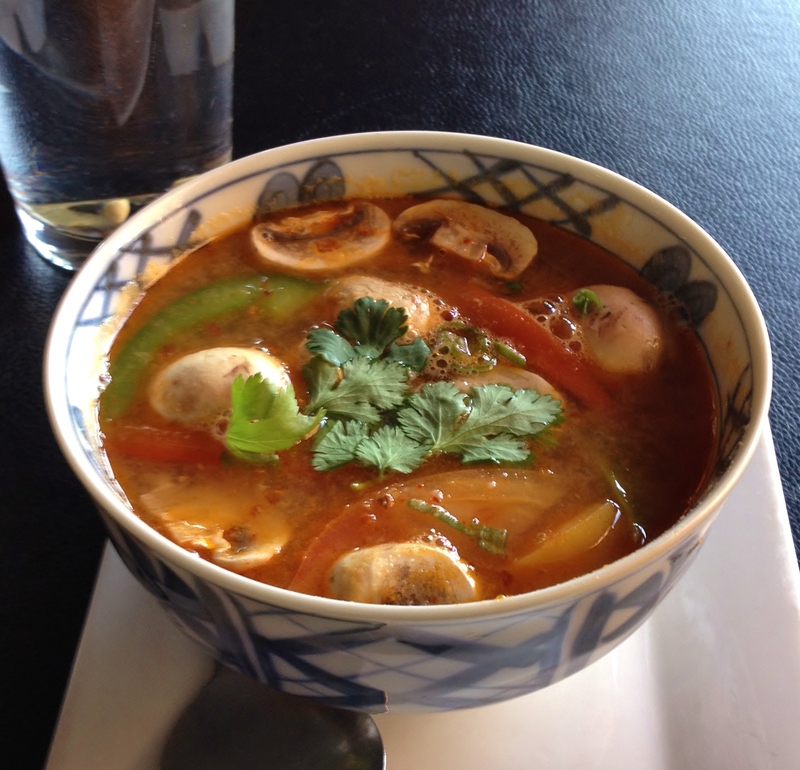 My favorite: Tom Yum Soup with shrimp. The secret here is FRESH ingredients and balance of flavor. TYS can go way too salty, sour, or spicy very quickly. Ma & I continues to nail it. I have gotten this soup and the rolls all 3 times I have been here. My mom ordered this, and I am so glad she did, because I wanted to try their version of one of my other favorites. Generous portion, freshfreshfresh, and well, but lightly enough, dressed for me to enjoy without trepidation and for any and all to enjoy. Oh, Hamachi, how I love you. This hamachi honestly blew my socks off. Seriously the best I have had, maybe ever. Literally a melt-in-your-mouth experience. 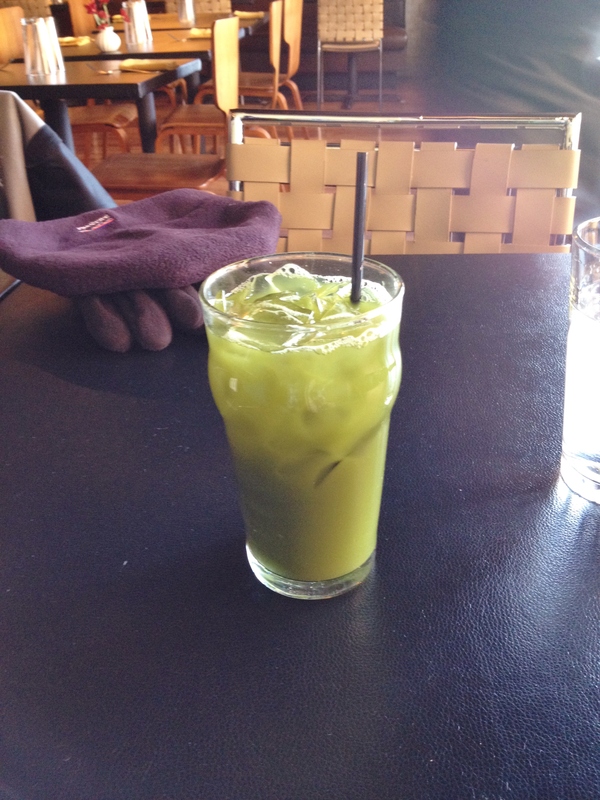 Another first for me: Ma & I’s iced green tea (I got a hot green later as well). Not what I was expecting, but delicious! Unsweetened and truly honest-to-God pure green tea. My mom also got chicken satay, which was really quite tasty and definitely will be something I will have to contemplate next time. I had my eye on ordering their Naem Sod for comparison to my other favorite, from Dao near my apartment. I ultimately opted to get what I know they do amazingly, and it was a perfect day for soup. My bro got the Massaman Curry, which was really good, but not something that I can get away with ordering, stomach-wise. I might suggest it to Alex some time, though–it is a great introduction to coconut milk for those who don’t like coconut–you first get curry, herbs, and spice and get the creamy texture and slight “beachy-ness” of the coconut at the finish. Obviously, I love this place, and will absolutely be back. The portions are spot on and generous, the price is more than affordable, and the people are super nice and very professional. 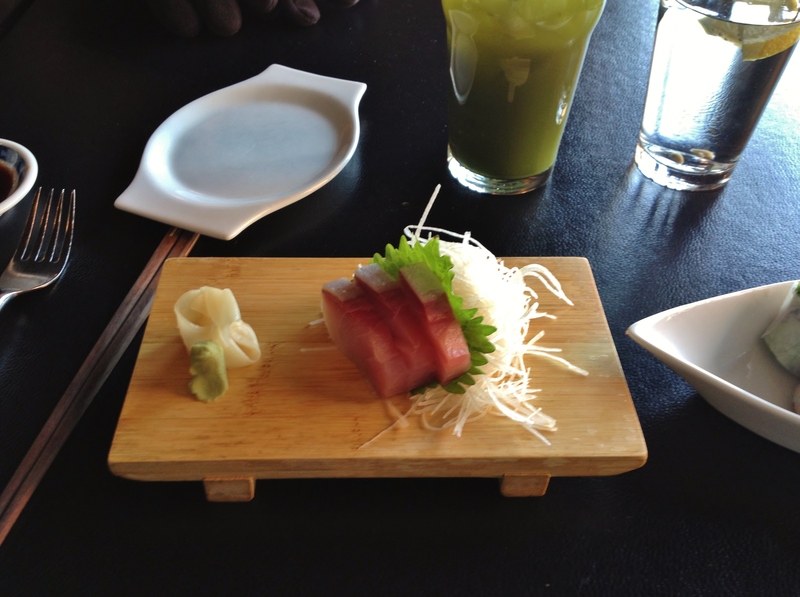 They have the classics and some more creative dishes, especially their house maki. I so, so wish that I could get some of those, but I would have to so dissect the creations that it isn’t worth it to order only to delete half of the dish. I have too much respect for the food and chef to do that. I will totally steal bites, though. It is very fortunate for my wallet that this restaurant is a bit more removed from where I live: it is still very much a treat to me. I know that I could order in, but Alex and I don’t typically go that route–if we are staying in, I will likely cook, we are trying to be super low-key, or we are HANGRY. We like to go out in order to go OUT–even if we are going to Panera, we enjoy removing ourselves from our every day environs and really focusing on time spent together. The truest sense of Thanksgiving, in my humble opinion. I hope that you are able to find a moment of togetherness and connection with your friends and family every week, be it over food, croquet, cards, thumb-wrestling, or Skype. Let’s keep the spirit of this holiday alive throughout the year, even though we give thanks for it once annually. What is your favorite cuisine? Do you like Thai? What do/don’t you like about it? Texture vs flavor? Apart from the main Thanksgiving meal, how else did you connect with your loved ones? Especially if you weren’t able to be with them for the weekend? Do you make time for these moments in your daily life?